Have you ever wanted to make your mark on the world? Rob Stouffer of Lee’s Summit is doing that, literally, every summer through early fall, for the past thirteen years. His work has taken him to 30 different states (including Hawaii), Canada and Mexico and has led him to work with national, state, and regional brands such as South Carolina Department of Agriculture’s “Certified SC Grown”, 97.7 WCTY “Eastern Connecticut’s Country!” radio station, and the St. Louis Cardinals baseball team. He has even done work with the Seal of the President of the United States. How does a guy with an agriculture background have such a huge visual impact on corporate branding? The answer might surprise you- corn mazes. Rob is the owner of Precision Mazes and he and his small team of designers and support staff take pride in their ability to maintain the integrity of the logos that they carve into corn fields. Rob is also the “mystery man” behind the Spirit Airlines crop art that appeared near Kansas City this past July. 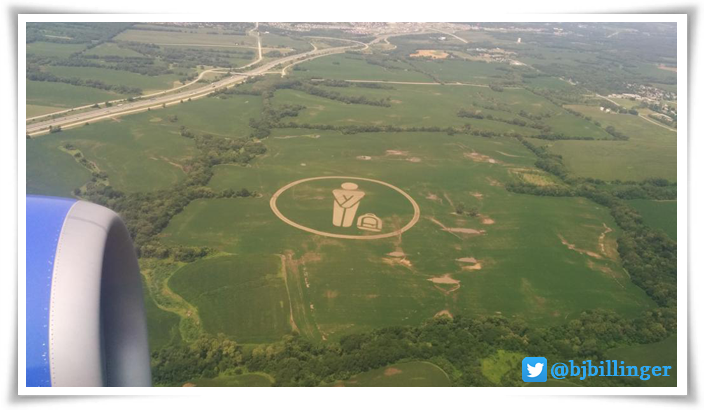 Rob Stouffer of Precision Mazes was the “mystery man” behind Spirit Airlines crop art near Kansas City International Airport. In 2001 Rob was working with farmers on integrating GPS technology into crop production. One of these conversations turned into a talk about the farmer wishing that he had a corn maze. Rob jumped at the chance and before that year’s corn maze season was done, he had completed three mazes. The next year, 2002, Rob completed 15 mazes. His company has experienced growth every season and one of the best compliments that he can receive is to be invited back to a location to work on the next year’s maze. Rob describes his mazes as a family experience- a life size puzzle that engages people. He says that families visit corn mazes to have a great experience- and to have a fun time. Corn mazes are becoming an annual tradition and a part of fall culture. A corn maze experience can lead to a lifetime cycle- parents helping a young child through the maze, a tween navigating the maze with a church group while their parents navigate it on their own, a teenager navigating the maze with school friends or teammates, a young college student asking a date to accompany him to the corn maze from his childhood- and finally that young adult and his bride bringing their youngster to the maze to work their way through it together. Rob’s genuineness is readily apparent when he describes this cycle and he is sincere when he thanks the farmers who bring a corn maze into a community for the service that they are providing for regional visitors- visitors who may not otherwise experience agriculture first hand. Rob Stouffer of Precision Mazes and Larry Helms of Boiling Spring Campground confer one last time before the corn maze work begins. 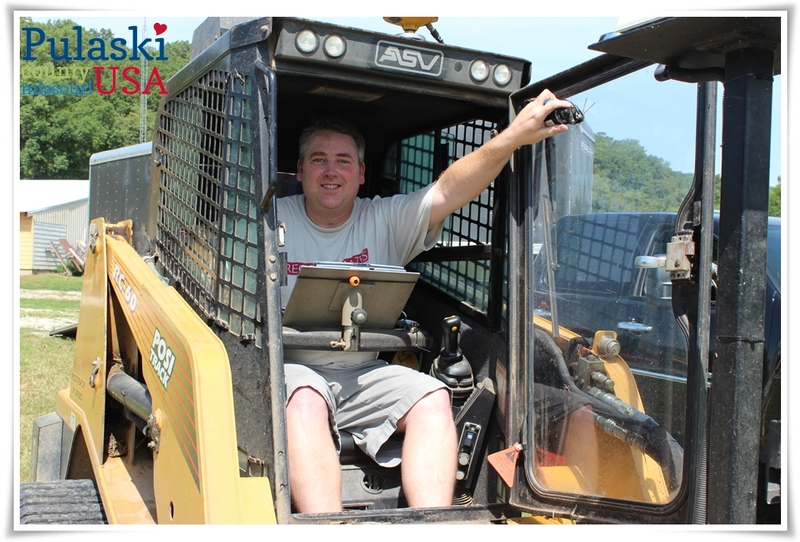 I met Rob on one of the hottest days of the summer, just before he began cutting the corn maze at Boiling Spring Campground on the banks of the Gasconade River in northern Pulaski County, Missouri. With about 12-15 acres of corn to work with he, and his enhanced global positioning satellite (accurate within centimeters), were turning the FIREBALL RUN logo into the largest precision cut corn maze in mid Missouri. He expected the work to take at least eight hours and estimated that he would be cutting about 2 1/2 acres (300-400 bushels) of corn out to create the pathways. Rob Stouffer’s office while in the field. Rob’s crop art creation at Boiling Spring debuts to the public Saturday, September 20th at 10 am. Admission to Pulaski County’s premiere precision cut corn maze is $7 for adults, $5 for children 5-14, and kids under 5 are free. The corn maze will be open Fridays (5-8 pm), Saturdays (10 am until 8 pm) and Sundays (10 am until 6 pm) through November 1st. They are open on weekdays to accommodate groups. For more information about Boiling Spring Campground visit http://bscoutdoors.com. The Fireball Run logo will be the design of Boiling Spring Campground’s corn maze for the 2014 season. For more information on FIREBALL RUN and the live event in Pulaski County, MO. October 2nd, 2014 please visit http://www.fireballrun.com. 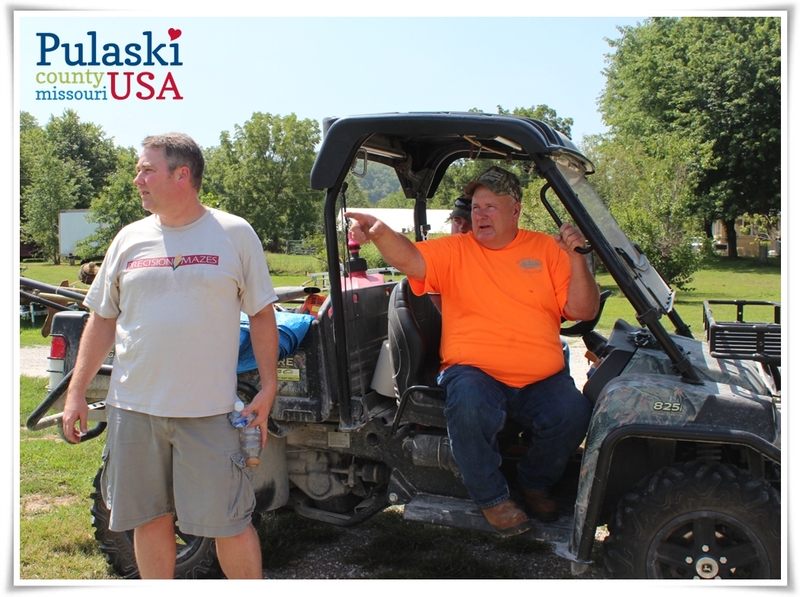 For more information on agri-tourism and Autumn activities in Pulaski County, Missouri please visit http://www.PulaskiCountyUSA.com. This entry was posted in Fireball Run and tagged Agri-Tourism, Corn Maze, Fireball Run by Pulaski County USA. Bookmark the permalink.